A Visit to “Light Dispelling Darkness” in Roosevelt Park ~ The History Girl! Most visitors to Roosevelt Park in Edison, New Jersey will pass by this empty fountain thinking not much of it, their attention focused on the globe perched high at the top. 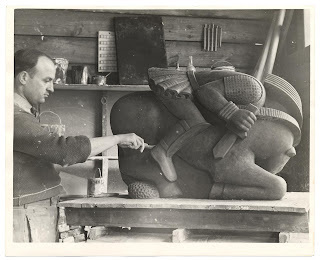 However, many fail to notice the evils dispelling from the center, which make the sculpture all the more interesting and relate a bit of creativity that its maker, artist Waylande Gregory envisioned when he designed it in 1937. "Light Dispelling Darkness" in Roosevelt Park, Edison, New Jersey. “Light Dispelling Darkness” was part of a New Jersey Federal Arts Project under the Works Progress Administration (WPA). The WPA was part of a federal program under the Franklin D. Roosevelt Administration, designed to create jobs during the Great Depression. The fountain incorporates Gregory’s concept that light and knowledge dispels ignorance in society, and was sculpted in part from terra cotta. Terra cotta was a large industry in New Jersey and was produced locally in Woodbridge, Perth Amboy and Sayreville during the late nineteenth and early twentieth centuries. The sculpture also honors the achievements of Thomas Edison who triumphed over darkness with the electric light. Gregory works on the sculpture in Perth Amboy, New Jersey, 1937. Its creator, 32-year-old Waylande Gregory, was also the director of the WPA-funded New Jersey Federal Arts Program. In 1933, Gregory and his wife Yolanda moved to Perth Amboy from Michigan where he set up a workshop in the Atlantic Terra Cotta Company, founded in 1846 in Perth Amboy. “Light Dispelling Darkness” was meant to be an allegory of human progress. In the center of the fountain stands a fifteen foot tall pillar circled with reliefs of the "good" in society: science, labor/industry and a world peace conference. The pillar is topped with a globe weighing 9,000 pounds, making it resemble the Edison Memorial Tower, built one year earlier and located roughly one mile away. The interpretive sign at the site calls the fountain, "the pinnacle of 1930s public art in New Jersey." What is most striking however, are the Evils fleeing the light. There are six, each atop a buttress radiating (or dispelling) from the pillar: the four horsemen of the apocalypse as well as two additional sculptures that represent Greed and Materialism. Death is a skeleton; War a Roman warrior wearing a WWI gas mask; Famine a cadaverous lady; Pestilence is a blue woman with yellow spots lying under a horse with a dollar sign on its backside; Greed is two entwined octopi; and five-headed Materialism spews a ribbon of Stock Market ticker-tape. By the beginning of the twenty-first century, time had taken its toll on this magnificent piece of art. Portions of the terra cotta were deteriorating and missing, paint chipped and a tree was growing out of the top of the globe. Thanks to the efforts of the Middlesex County Freeholders, the Middlesex County Cultural and Heritage Commission, the Middlesex County Parks Department and County Engineer, funding for a full restoration were secured and a grant was received from Save Outdoor Scuplture, a Washington D.C. based non-profit organization which advocates and raises awareness for public art and sculptures. Using historic photographs, models and written documentation from the estate of Waylande Gregory, the County followed Gregory’s original water and lighting design concepts and restored the fountain to its original glory. 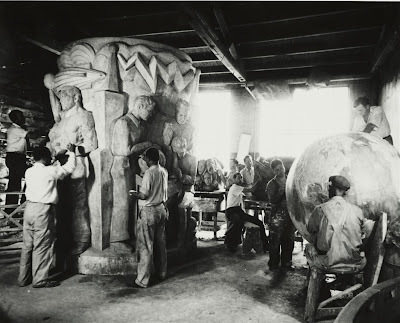 Working on the sculptures in Perth Amboy, NJ -1937.